In Africa, finding the ‘delicious balance’ between quality, compliance and profitability is top of the agenda for meat manufacturers. Consumers have a wide range of products to choose from and the pressure on producers is getting higher. 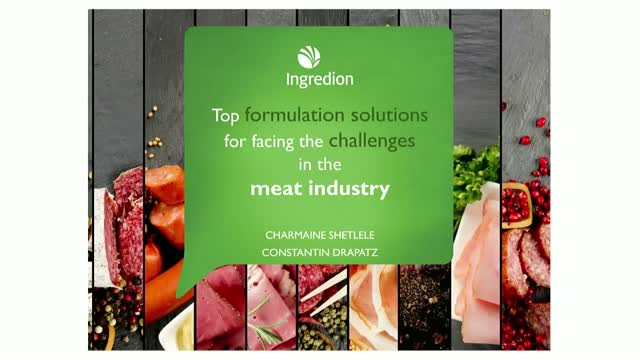 Our webinar will expose the top formulations for reducing costs while maintaining quality and enhancing overall eating experience in processed and fresh meat. Los números no mienten, las tendencias nos lo dicen y los consumidores nos lo piden. Respira hondo, analiza tus opciones y tú también pide un SUGAR BREAK. El uso del azúcar en los productos que consumimos ha ido a la baja en la preferencia de los mexicanos. Esta situación le ha empezado a abrir camino a nuevas soluciones de dulzor; ignorar a los consumidores en este momento ya no es una opción. Conoce más detalles de la tendencia en reducción de azúcar y las preferencias en dulzor de los mexicanos en esta Conferencia Virtual. In the Middle East, finding the ‘delicious balance’ between quality, compliance and profitability is top of the agenda for dairy manufacturers. Consumers have a wide range of products to choose from and the pressure on producers is getting higher. Our webinar will reveal the best secrets on ingredient solutions that can help you find the delicious balance. In the webinar, we’ll show you how starch can reduce costs and improve the eating experience of dairy products and will discuss specialist co-texturisers for cost-effective fat replacement in dairy applications. In Africa, finding the ‘delicious balance’ between quality, compliance and profitability is top of the agenda for dairy manufacturers. Consumers have a wide range of products to choose from and the pressure on producers is getting higher. Our webinar will reveal the best secrets on ingredient solutions that can help you find the delicious balance. In the webinar, we’ll show you how starch can reduce costs and improve the eating experience of dairy products and will discuss specialist co-texturisers for cost-effective fat replacement in dairy applications. Rodolfo Garza, Gerente de Innovación en Ingredion México, hablará sobre la conferencia TU CONSUMIDOR ESTÄ CAMBIANDO con insights e información valiosa del estudio que realizamos con consumidores mexicanos acerca de su percepción en productos saludables impartida durante The MEXICAN Healthy Product Summit 2018. As the clean label trend gains traction across the globe, how can manufacturers develop relevant and differentiated products for consumers with a wide range of preferences? With unprecedented demand for clean label products and a seemingly endless stream of “on-trend” ingredients, manufacturers are challenged to find ingredients that both offer functionality and have lasting appeal to consumers. How can manufacturers be sure their products will gain traction in different areas of the globe and avoid becoming the latest passing trend? Zulma Ramírez, Profesional de Asuntos Regulatorios y Nutrición de Ingredion Colombia. Las tendencias globales de salud y nutrición se enfocan principalmente en agregar (nutrición más) o quitar (nutrición menos) ingredientes. Los consumidores cada vez están buscando más productos fortificados con proteínas, fibra y otros nutrientes y reducir o eliminar azúcar, grasa y calorías de sus dietas alimenticias. ¿Cómo puede responder la industria a estas tendencias? Acompáñanos el 12 de diciembre de 10 a 11 a.m. para abordar juntos estos desafíos. Sugar reduction is a major trend—consumers want healthier products, and new government regulations could steer consumers away from added sugars. Of course, consumers still want sweet foods and drinks. How can manufacturers respond? Join us to learn more about taking sugar to new lows. Of the 100 million Americans who consume gluten-free products, only around 25 percent have a gluten intolerance or wheat allergy (or believe they do)*. Therefore, those who voluntarily go gluten-free are driving market growth. To satisfy the quality demands of these consumers, it is essential to replicate the experience, shelf life and nutrition of gluten-containing products. This presentation will focus on the functionality of flours, starches, proteins and hydrocolloids in gluten-free products, along with case studies and formulation guidelines to offer high-quality solutions to gluten-free challenges. This research-driven webinar will focus on current global trends in clean label ingredients, consumer perception of flours compared to other common texturizers, and differences in ingredient perception by application. Recent research has uncovered that consumers fall into one of four categories of eating style - crunchers, chewers, smooshers or suckers. According to the research, chewers enjoy a prolonged chewing action, crunchers like the sound and feeling of a hard bite, smooshers enjoy manipulating soft food in their mouths, and suckers enjoy extracting as much flavour as possible. We can help food companies use these findings to improve formulations and their front-of-pack messaging. By understanding each eating style, manufacturers can develop more successful products. In this webinar, we focus on yoghurts to show you how you can use these innovative insights. Pat O’Brien and Dilek Uzunalioglu, Ph.D.
Research shows that today’s consumers want great-tasting foods and beverages that offer enhanced nutrition and clean labels. They’re also looking for plant-based protein and sustainably sourced ingredients. Pulses help you meet these hot consumer trends—and we see their use in formulations skyrocketing. But when should you leverage their natural, beany flavor profile and when should you choose a clean-taste version? Get consumer insights and formulation tips in this pulse-focused webinar. As one of the few plant-based, sustainable, high-quality proteins, pulses have gained widespread attention in recent years. The United Nations designated 2016 as the International Year of Pulses. In this webinar, you’ll see how pulse flours and proteins compare to other commonly used flours and proteins. You’ll also learn how to leverage pulses’ functional and textural benefits and how to overcome formulation challenges. Case studies will highlight protein enhancement, allergen replacement (including gluten-free products) and cost savings across a variety of application areas—from bakery, snacks and pastas to dairy, soups, sauces and dressings. Discover how to meet demand for plant-based protein in deliciously differentiated foods and beverages with pulses. Register today. In the last instalment of the Ingredion cheese series you heard from our experts on the direction the industry is taking, the challenges they continue to face and the growing trends in cheese consumption globally. In this upcoming webinar we will now focus on how Ingredion is bringing innovation to address your biggest cheese challenges. Learn about how we design and develop ingredient solutions based on industry needs that can be combined with our proprietary understanding of consumer eating style preferences leading to finished products that will delight a broader consumer base. Register now. As the clean label trend continues to grow globally, you will need every advantage to stay ahead. Get the latest insights into what defines “clean and simple” labels for consumers in Asia Pacific, who are looking for products that are “natural,” less processed, and free from chemicals and other undesirable ingredients. What do those terms really mean, and how can you make them add value? “Clean label” and “simple label” are terms we hear used every day in our industry, yet most consumers have never heard of them. The trend toward clean and simple is now global and a major challenge for processed food manufacturers, but the indicators used to analyze the trend can be misleading. Drawing on deep consumer and manufacturer research, this webinar addresses what “clean label” and “simple label” really mean for consumers, how the two terms differ, and how we can most effectively market them. Eager to elevate every bite and every sip of your food and beverage products? Need to save money or improve sustainability throughout your corrugating operation? Want to get your new product to market faster with greater success and profitability in pet food? You can—with global expertise in consumer insights, applied research, applications knowhow and process technology from Ingredion Idea Labs™. Imagine solving key product challenges with a team of experts who bring you the latest science and original thinking from our global network. Picture lively collaboration on the fundamental benefits you and your consumers want most: quality, affordability, sensory experience, health and nutrition, and clean and simple products. That’s the experience of working with the experts of the 25 Ingredion Idea Labs™ innovation centers around the world.